Savory shrimp soup seasoned with lemon grass, kafir lime leaves, lime juice, mushrooms and chili paste. Tender strips of chicken cooked in coconut milk seasoned with galanga, lime juice, and chili peppers. Bean‎ thread noodles with asparagus and crab stick. Soft bean curd soup with pork and straw mushroom in clear broth. Tender strips of chicken and mixed vegetables cooked in aromatic clear broth. Stuffed ground chicken wontons in aromatic clear broth. Crispy fried spring rolls stuffed with ground chicken, bean thread and variety of vegetables. served with homemade plum sauce. Grounded seasoned chicken wrapped with wonton skin and deep fried. served with plum sauce. 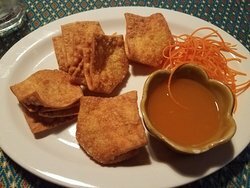 Golden fried bean curd cake served with tamarind peanut sauce. Crispy fried shrimp wrapped with spring rolls skin served with plum sauce. 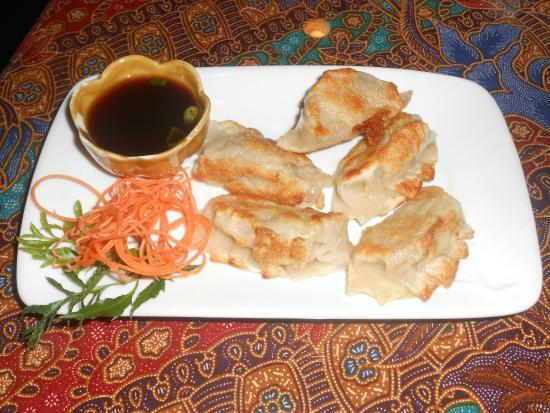 Pan fried dumplings stuffed with ground pork, ginger, and scallion served with warm soya sauce. Thai crepes stuffed with minced shrimp, shredded coconut, bean sprouts, and ground peanuts. Ground pork mixed with spices, spread on French bread dipped in egg batter and fried served with cucumber salad. 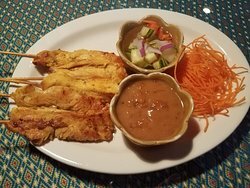 Choices of marinated chicken or pork barbecued on skewers served with peanut sauce and cucumber salad. Crispy rice noodles and shrimp tossed with sweet tamarind sauce. 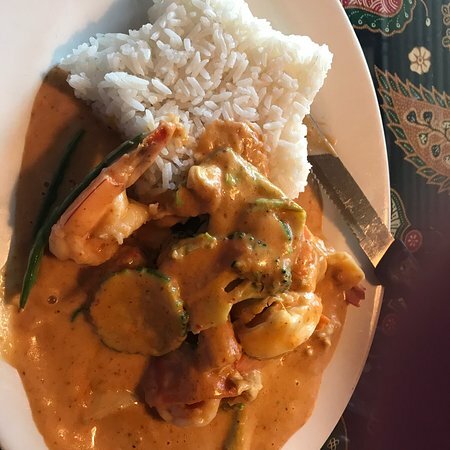 Minced‎ shrimp mixed with Thai spices fried until golden brown served with cucumber peanut salad. Shredded‎ chicken, hard broiled egg, tofu, bean sprouts, tomato, and cucumber on a bed of fresh lettuce with Thai peanut dressing. A popular northeastern Thai salad. shredded raw cabbage mixed with green beans, tomatoes, chopped peanuts, lime juice and chili peppers served with sun-dried beef. Bean thread noodle, ground pork and shrimp mixed with lime juice, onion, and chili peppers. Ground pork or chicken mixed with lime juice, ginger, roasted peanuts, onion, and chili peppers. Grilled NY steak seasoned with lime juice, chili pepper, cucumber, and onion. Cooked shrimp mixed with chopped lemon grass, lime juice, onion, and roasted chili peppers. Grilled‎ chinese sausage tossed with lime juice, onion, cucumber, tomato, and chili pepper on a bed of fresh lettuce. A favorite Thai dish: rice noodles stir fried with mixed vegetables, egg, ground peanut, bean sprouts, and scallion. Stir fried rice noodles with sweet basil, mixed vegetables, and chili paste. Stir fried rice noodles with broccoli, egg, and black soy sauce. Sautéed rice noodles topped with broccoli gravy and bean sauce. Stir fried egg noodles with bamboo shoots, snow peas, mushroom, and bean sprouts. Stir fried bean thread noodles with assorted vegetables. 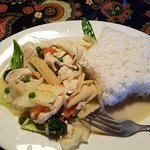 Zesty curry cooked with coconut milk, bamboo shoots, and peas. 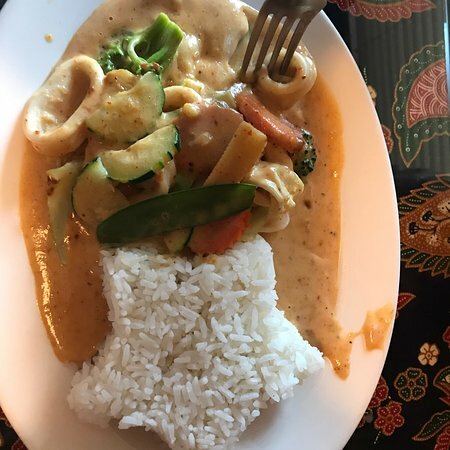 Cooked in creamy coconut milk, and mixed vegetables. 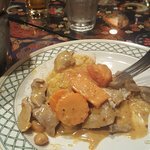 Southern style creamy curry simmered with potatoes, onions, tomatoes, and roasted peanuts. Cooked in coconut milk with natural sweetness of crushed pineapple. With assorted vegetables, beef, pork, chicken, shrimp, squid, crab sticks, and Chinese Sausages. Spicy‎ fried rice with assorted meat and seafood. Sautéed shrimp with house tasty chili sauce on a bed of vegetables. 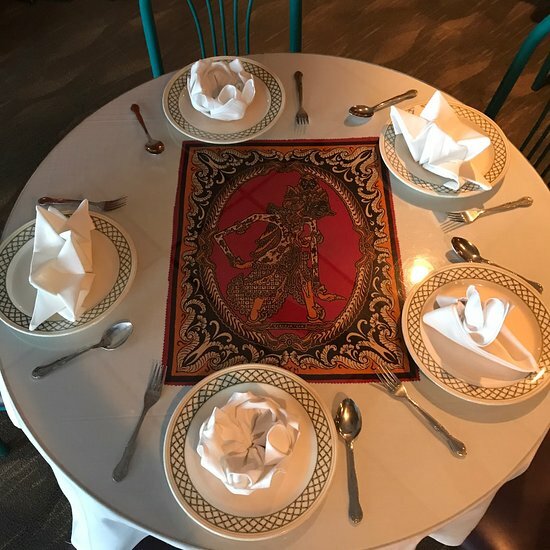 Roasted Duck cooked with pineapple, tomato, and cashew nuts in a red curry sauce. Fried crispy frog legs with garlic and black pepper. Fried crispy frog legs with sweet basil in hot spicy chili paste. Shrimp sautéed with ground pork, egg, scallion, and assorted vegetables served on a sizzling plate. Assorted meat and seafood sautéed with roasted chili paste. Fried crispy pork or chicken sautéed with spicy three flavors sauce on bed of steamed vegetables. Stuffed with ground pork, shrimp, tomato, snow peas, onion, and bell peppers. Fried whole fish topped with chili sauce. Fried whole fish topped with garlic and black pepper. Fried whole fish topped with curry sauce. Fried whole fish topped with tomato, pineapple, and mushroom in sweet sour sauce. Fried whole fish topped with pork, ginger, onion, mushrooms, and bean sauce. 내 형제와 난 전채 와 저녁 식사 및 저녁 먹으러 갔다. 다른 홍차 들 을 제공해 주는 팟타이 lomein 및 도 좋았습니다. 케이프 코럴에 있는 시암 헛 좋아하는 레스토랑. 직원들이 정말 훌륭했고 음식도 완벽한! 감사합니다! 작은 쇼핑 센터에 자리 잡고 있는 시암 헛. 그랜드 입구 없습니다. 그 문을 통해 갈 수 있었어요. 사랑스러운 곳에서 식사 하는 것. 직원들은 훌륭하고 협조적이며 입니다. 잘 꾸며져 있는 전통적인. 메뉴는 모두를 위한. 꼭 다시 올 걸지 사용자_이름:. 남편과 저는 다양성에 놀라게 하는 메뉴와 분위기. 제가 그린 카레와 치킨. 나는 가벼운, 하지만 쉽게 할 수 있는 중간 향신료. 여기에 꼭 다시 갈 거에요. 우리가 제일 좋아하는 레스토랑 중 하나인 " 케이프 "
포트 로더데일에서 마이애미 / 태국 음식은 정말 어디서 오. 정말 흥분 되고 감격 해 남편과 저 의 시암 헛 요리. 여기는 내 이동이 훨씬 좋았어요. 우리는 여기 단골 입니다. 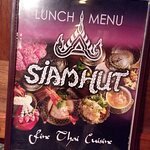 Siam Hut 직원 및 이전 방문객에게서 빠른 답변을 구하세요.